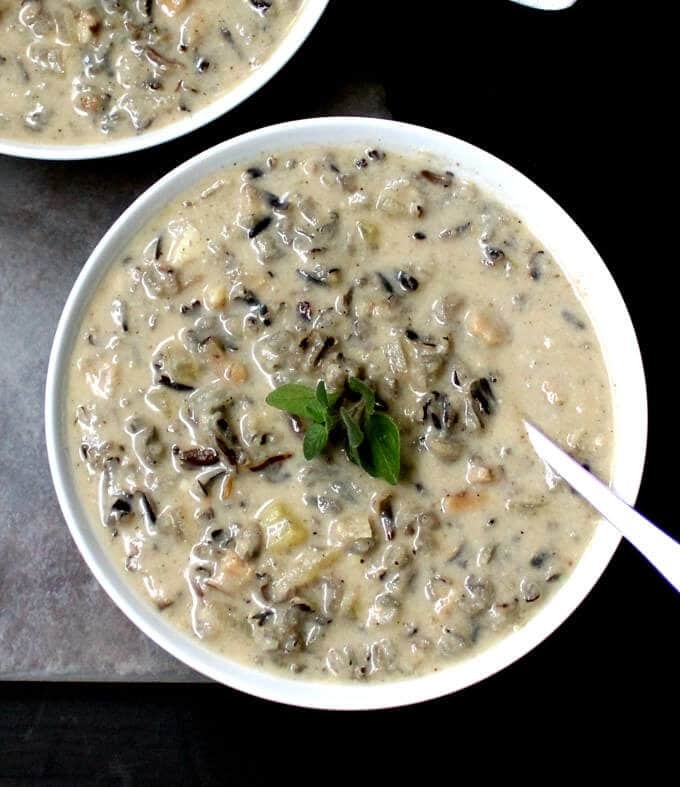 A creamy Mushroom and Wild Rice Bisque that’s healthy and makes a hearty meal by itself, but has just 153 calories per serving and is so decadent tasting. 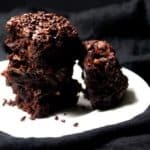 Vegan, gluten-free, soy-free and can be nut-free. It’s the weekend after Thanksgiving, the elaborate feast you made for your family and friends has been polished off, and you don’t want to see a pie again as long as you live. But you do need to eat. On days like these I find myself craving something healthy and warm and satisfying, like a hearty vegan soup. 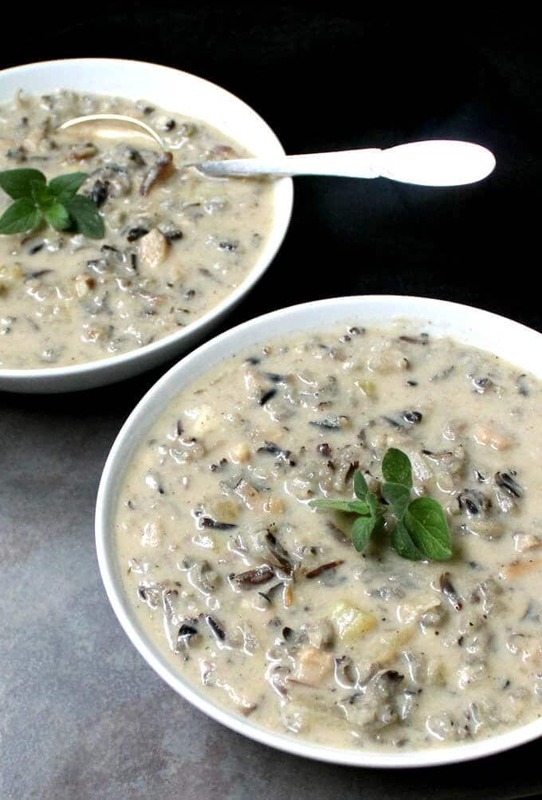 This Mushroom and Wild Rice Bisque hits the spot. It’s nutritious enough to be health food and has just 153 calories per serving, but it doesn’t taste like health food. 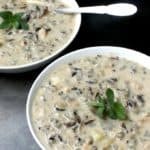 Instead it’s creamy and fragrant with herbs, has delicious bits of wild mushrooms and wild rice, and, best of all, it warms you from the inside out. If you don’t feel like driving yourself to the store this weekend — and who would blame you — you’re in luck, because everything you need to make this bisque is probably right in your pantry. 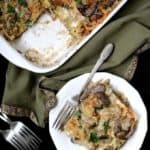 I found myself without fresh mushrooms in my refrigerator after Thanksgiving this year, because I’d used them all up to make my Mushroom Pot Pies. But I did have some dry wild crimini mushrooms and a jar of wild rice. Some onions, garlic and celery, and I was on my way to soup heaven. 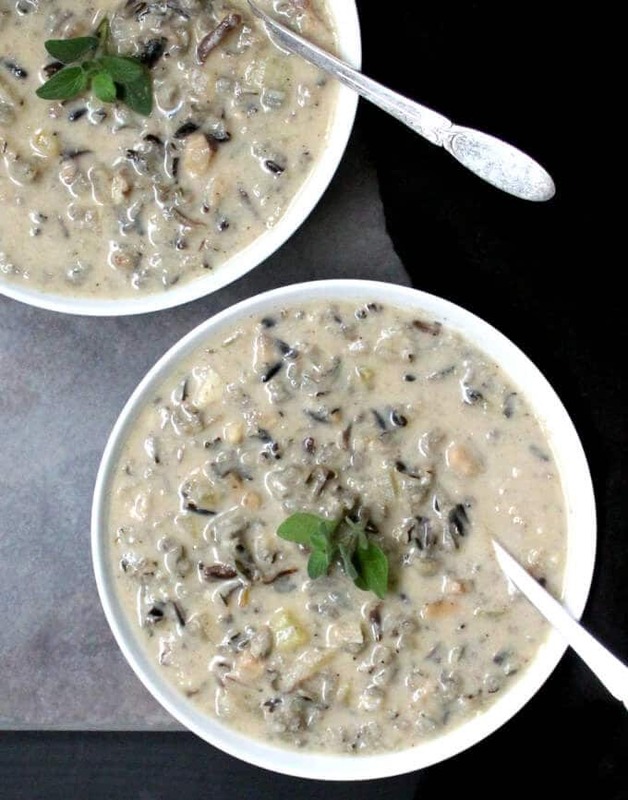 This soup also comes together with very little effort, so you don’t have to spend an hour over the stove after having spent half the week cooking. 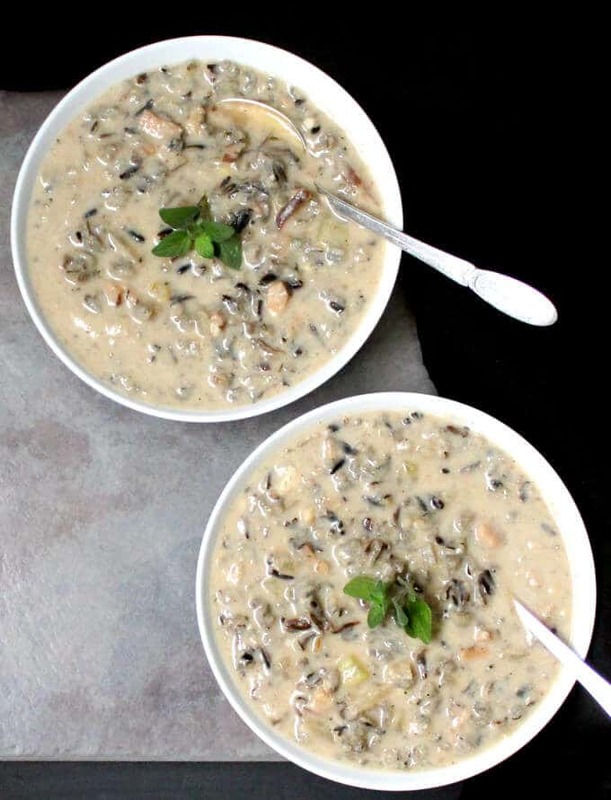 Make sure you cook your wild rice separately, before you add it to the rest of the bisque, to get the perfect texture. 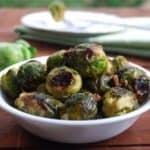 -Use fresh crimini or button mushrooms, if you have those around, instead of the dry mushrooms. You don’t have to reconstitute the mushrooms, as you would the dry, so you’d be saving yourself an extra step. 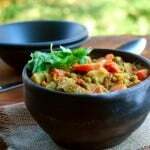 -Use regular rice instead of wild rice. Or barley would work too! If you do use regular rice, I’d go with a long grain that’s less starchy, and you might need to thin out the bisque with more stock. -Use leeks instead of onions. Or shallots. -Vary the herbs in your bisque. I used oregano and thyme, but rosemary or sage would be wonderful too. You can use fresh or dry herbs. -If you don’t want to use cashew cream or are nut-free, blend 1/4 block of silken tofu and add it to your bisque instead. 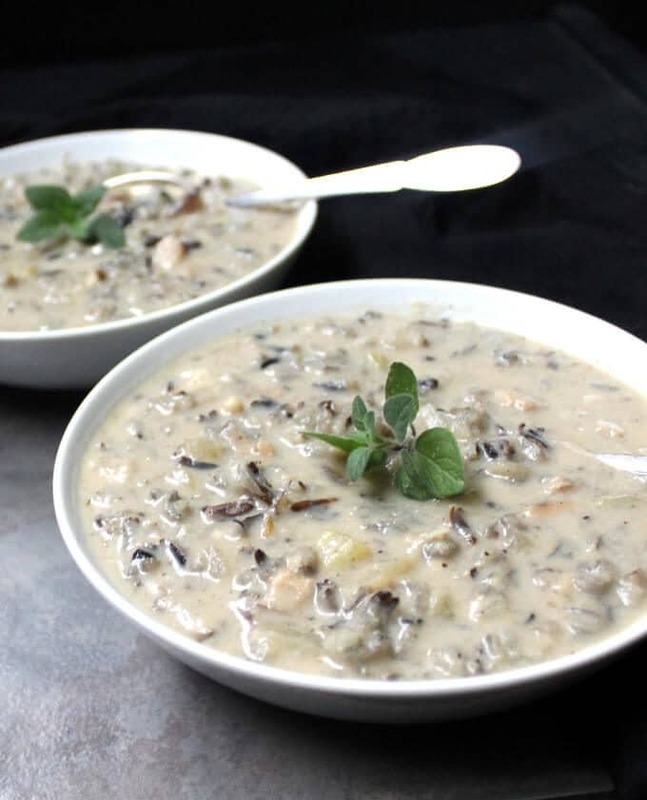 -Make this a cream of mushroom soup by skipping the wild rice. 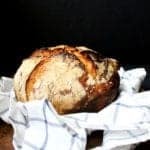 Serve this delectable bisque with a crusty wholegrain bread like this one and a leafy salad. That’s all you need for a healthy, delicious and memorable meal that won’t make you feel like the weight of the world is in your stomach. Very excited! I have all the ingredients except the wine…any suggestions for a substitute? Skip it — it’ll still be delicious. Let me know if you liked it! You can use Chicken Broth or try White Wine Vinegar. I just made this DELICIOUS bisque & I substituted the wine with 2 T. mirin. SO GOOD!! I’ll be making this again. 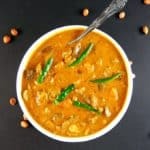 Vaishali – thank you so much for sharing your creative and delicious recipes! A question about this one, I ended up with very little liquid (not at all a soup), then looked back at the ingredients and realized the only liquid called for is a 1/4 cup of white wine, and 1 cup vegetable stock. Not sure how this could make 4 servings of soup? I ended up adding a lot of water (and additional herbs/spices to compensate). Did I miss something? It’s entirely possible I did! Or maybe a measurement is missing? Thank you in advance for any thoughts! It did end up delicious (I added a few splashes of sherry vinegar by the way)! Hi Heather, you need to add the reserved mushroom stock as well, from soaking the dry mushrooms. Or if using fresh mushrooms sub with two more cups of vegetable stock. Sorry the instructions weren’t clear — I’ve clarified and happy you still enjoyed the soup. 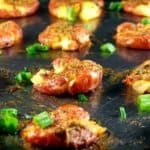 This is so warm, comforting and easy to eat. I just gobbled up a big bowlful with a chunk of warm crusty garlic bread. I ended up running out for another errand so was able to pick up the wine. My only modification to the process: when trying to blend the 1/2-3/4 soup in my Vitamix, there wasn’t enough to grab the blades so I poured in 1/2 of the cashew/broth mixture in order to blend. Worked just fine. As a single person household, I appreciate that it didn’t make an entire stockpot of soup. BUT- it’s so tasty. Do you think I could double the batch next time and freeze some for later? Hi Nicole, so happy you liked it! I use about 3 cups of broth/stock altogether, including the 2 cups of mushroom broth, but add more liquid if you need to. You can definitely double the batch and freeze. This was so good! It didn’t last long, and we will be making it again. As someone else noted, it needed more liquid, which I added. Thank you for correcting the recipe. Gayle, great to hear. Thanks! Made this wonderful soup this evening. Thank you for this delicious and comforting soup.